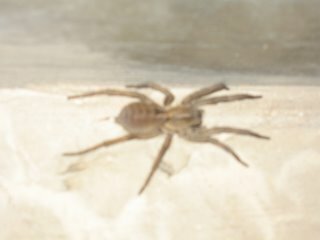 We found a large spider in Chad's classroom the other day. Hence the photo. Chad wanted to step on it, but I decided to find out if there is a standard procedure of removal. The procedure is to step on it. To me, that was like stepping on a small mouse. It gave me a very gross and crawly feeling to think about it. And it would be gooey. Chad decided to capture it and put it outside. We did snap a couple of pictures, though. Chad had to be the one to get the close ones...I was certain it was going to attack me. What a lovely arachnid... but smaller than the one in your dining room at Kapawi eh? I'm with you chad - step on 'em!